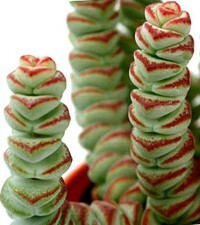 Crassula perforata x Crassula rupestris var marnieriana may be the best hybrid in the genus Crassula. The resulting plant, commonly called “Baby Necklace” is a very hardy attractive ornamental plant with small, rounded, fleshy short bladelike leaves. Crassula perforata x Crassula rupestris var marnieriana leaves are often so tightly stacked that the plant’s stem is nearly invisible between the leaves. These dramatically multicolored leaves, with green centers with red edges, resemble a string of beads on a necklace. Growing 6-12 inches long, these “bead strings” rarely branch stay compact. Crassula perforata x Crassula rupestris var marnieriana is drought-resistant and cold resistant, and can handle half-day to ¾ day sun, or bright filtered light. It needs good drainage.